GALION — With an eye on the future, Galion school board members listened to a presentation this week about ways to fund a proposed bus garage, athletic field and perhaps even a fine arts center/auditorium. Michael Burns, director of Robert W. Baird & Co., delivered the presentation during a Tuesday school board meeting. The school district can take out a loan and pay for it out it from revenue it expects to receive in future years. The school district can ask voters to support some type of levy to pay for the building projects. The school district can come up with a combination of a levy and paying for it by itself. The first option involves the school district taking on the entire debt to finance the project. The second is basically a lease. Money is borrowed against the projected revenue that a successful levy would bring in. The third option is obviously a combination of the two. Galion City Schools purchased a little more than 17 acres of property located west of Hesby Drive for $175,000 last year. At the time, they announced tentative plans for the property that included: building a bus garage to replace the current garage at the corner of Knorr Road and Edwards Street, and construction of a multi-use facility that could be used by the district for soccer fields, a new all-weather track and in the future more athletic fields and practice facilities, including a place for the marching band to practice. There also is the possibility of a new softball field. In a presentation to the school board last September, Galion superintendent Jim Grubbs stressed three reasons for the land purchase: safety, quality of life and control gaining control of the real estate adjacent to the school campus. No decisions have been made yet on when to start construction of the bus garage or athletic fields, nor a new auditorium. In Burns’ presentation Monday night, he discussed possible financing scenarios for $3.1 million (bus garage and athletic fields); $6 million (new auditorium) and $9.1 million (bus garage, athletic fields and auditorium). As with any financing, the longer it takes to pay off the loan, the more it will cost the district. Burns told board members that if they wish to go ahead with some type of building project, and if they can figure out how much debt the district can afford to take on or how much money they believe voters will approve in a levy, he will be able to come up with more exact numbers within a matter of weeks. In other matters, as Monday’s meeting was the first for the school board since the start of school last month, Grubbs talked about the success of the opening day of classes. Board members heard a presentation from teacher Matt Tyrrell, who, along with GHS grad Dustin Foust, designed and painted a new mural on a wall at Galion Primary School. 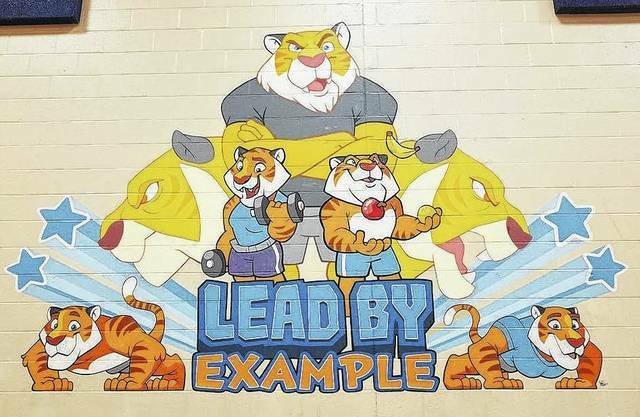 The mural, which highlights the phrase “Lead By Example,” shows several animated tigers doing push-ups, lifting weights and juggling several varieties of fruits. Tyrrell said the tigers represent students doing different activities to stay mentally and physically healthy and fits in with the district’s “Leader in Me” initiative. The board accepted a $5,000 donation from the Ralph E. Boyd Foundation that will help to retrofit one of the district’s older schools buses to help with the district’s summer lunch program. Board members approved a list of substitutes, approved several stipends for district staff and approved an agreement with North Central State College for more secondary education opportunities. The district’s goal is to give students in Galion a chance to earn a two-year college degree, while still attending Galion High School. The board also approved a resolution that brings returns the DARE (Drug Abuse Resistance Education) program to the district. It has been absent Galion since 2005. Crawford County Sheriff’s Office Deputy Chris Martin will head up the program.